Mr. Hoge acknowledges the receipt of Campsall's letter about the discontinuation of flour at the Ford mills and says they will find it elsewhere. He also thanks Mr. Campsall for the flour they already shipped. 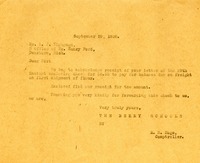 Letter to the office of Henry Ford from Martha Berry thanking them for a check that they sent for a shipment of flour. 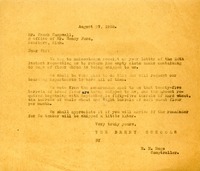 Letter indicating a shipment of flour composed of 55 barrels of hard wheat flour and 12 barrels of whole wheat with tagged description on bags. Shipment was made over the Chattanooga and Central of Georgia Railway. 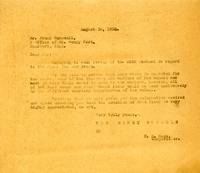 E. H. Hoge asks Mr. Campsall to start the next shipment of flour as soon as possible because they're afraid they'll have to buy some before the shipment reaches The Schools. In response to Mr. Campsall's letter about a flour shipment, Mr. Hoge informs him that the shipment was enough, but they will need the second shipment as soon as possible for term is starting soon. 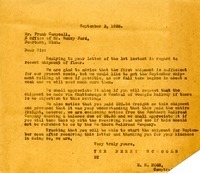 He asks that, if possible, the shipment be made through the Chattanooga & Central of Georgia Railway and asks him to work out a billing issue with the Southern Railroad Company. 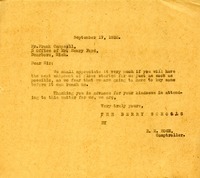 This letter acknowledges Mr. Hoge's message that the flour sacks mentioned in an early letter were being returned. 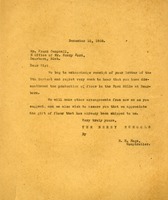 E. H. Hoge informs Mr. Frank Campbell that the store on campus is for the use of students and workers, and most of the flour will be sold to workers there. All of the hard wheat and whole wheat flour will be used by the boarding departments of the school. He hopes that this answers Mr. Campbell's questions and thanks him again for the donation. 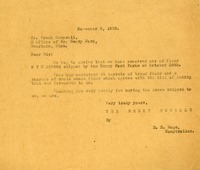 Frank Campsall writes to ask Mr. Hoge about what The Berry Schools do with the flour, if they resell it, and if so, who buys it. 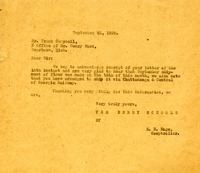 In this letter E.H. Hoge tells Mr. Campsall that he acknowledges that he will return the empty sacks of flower. 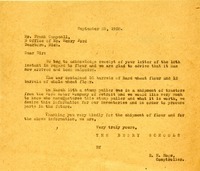 Request from Frank Campsall, associate of Henry Ford, for return of flour bags from the Ford flour mill.